I’d make a great Everton owner. That’s not just your typical pig-headed ‘know-it-all’ football supporter statement. I actually believe I’d be a good fit. Why? Because I’m the sort of guy who’d pull 3 consecutive all-nighters to finish university coursework that I’d had months to complete. I’ll wait until the very last minute before getting my act together and leaving the house in a morning for work. I have big dreams and grand plans, but end up spending most nights in my undies playing FIFA instead of actually taking action towards achieving said ambitions. It took me 5 full weeks to get angry enough to even contemplate writing this article, and even then, 3 half-arsed sittings to complete it. There’s always tomorrow, isn’t there? That’s the dangerous thing. And here’s the point: the fact that Everton STILL find themselves managerless 5 weeks after sacking ruddy-faced Ronald Koeman somehow manages to be both profoundly shocking and completely unsurprising. Shocking because this is the age of ruthless Premier League efficiency, of football clubs as huge business entities, of decisive billionaire owners with masses of business experience. Unsurprising because, of course, this isn’t a new phenomenon. As one of the unfortunate Evertonians to reach football maturity at the exact point in history when the Blues decided that winning silverware wasn’t worth the hassle anymore, I’ve been conditioned to recognise that nothing is ever simple or straightforward for this hapless organisation. For all our prestige as a club, for all the pats on the head for being ‘well-managed,’ and ‘a proper club,’ we somehow manage to make a bigger mess of this stuff than most other clubs could dream of. And by ‘this stuff’ I mean basically everything. Signing players, selling players, sacking managers, appointing managers. EGM’s, AGM’s, new stadia. Personnel have been and gone. Our deep-rooted institutional dawdling has been blamed on numerous individuals, from Peter Johnson to ‘Dithering Davey,’ Chairman Bill, Steve Walsh, Ronald Koeman and now Farhad Moshiri, who looks to be a perfect fit for the board of dilatory directors on which he apparently doesn’t have a seat. Looking back over my life as an Evertonian, it strikes me that nothing has ever actually been simple. Every time we’ve ‘bought big,’ we’ve pinched pennies and scrimped and saved until the deals were minutes from collapse. Mysterious hold-ups and delays have plagued, at a conservative estimate, at least 90% of incoming transfers I can remember. The interminable gap between ‘poised to sign’ and ‘confirmed signing’ must be at least twice as long as it is for any other club, and probably even longer, as rumours swirl of failed medicals and rival clubs ready to hijack bids. This has just been the Everton way for as long as I can remember. From the Andrei Kanchelskis saga of 1996, a transfer that rumbled on for weeks over a £1m sell-on fee owed to Shakhtar Donetsk; right through to the weeks, and I do mean weeks, it took us to sign Gylfi Sigurdsson for fourty-five times that figure in August this year. All part of one continuous, clumsy narrative. And to understand just how deeply ingrained this trait is, you need only rewind the clock twenty years and compare it to where we find ourselves now. In 1997, after Joe Royle’s departure from the club, Everton’s supposed sugar-daddy owner was in the process of wading his way through an ambitious shortlist of would-be managers at home and abroad, being met with rejection at every turn as the process became increasingly panicked. Optimism and ambition gave way to fear, and anxiety, and the road ultimately led to a brutal relegation dogfight that we somehow survived. Deja vu? Everton’s penchant for hesitation has now landed us in a situation where, ahead of what even the most optimistic Blue would acknowledge as a relegation six-pointer, David Unsworth will be in the dugout once again – despite 9 goals conceded in 2 games, and a broken demeanour that suggests he is utterly desperate to get back to coaching the under-23s. Who would bet against him being in charge for the Huddersfield game on Saturday, as well? It’s as if those in charge of the club have no sense of the passing of time. Everton’s search for a new manager isn’t far off MY first priority, and I have a full-time job and a family. It’s keeping ME awake at night, but the fact that every day brings nothing but further silence suggests that sense of urgency might not be shared by those in charge of the train set. Sam Allardyce looks likely to be the chosen candidate (although even today, 5 weeks on, we’re still apparently talking to 3 candidates) and I’ve seen a lot of anger directed towards him. With respect, though, I see Big Sam not as the cause, but the effect. Getting mad at him is like directing your anger at the fire instead of the arsonist. We might as well get behind him and support his team because, if nothing else, it’ll all just be more fun that way. 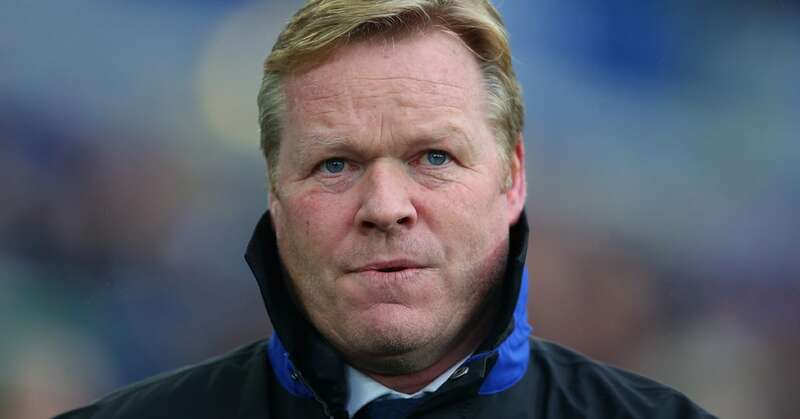 He’s a product of circumstance, the circumstance being that ‘The Ev’ have stalled and mismanaged, and failed to buy the last 3 pieces of Koeman’s bizarre impressionist jigsaw puzzle. That failure has somehow plunged our bright new dawn back to the days of Mitch Ward and Carl Tiler like some sadistic Delorean time machine. Up the procrastinating, incompetent, dilly-dallying Toffees.